Ok, I know these are NOT the colors you were expecting from me! After all, ORANGE (and Yellow) are NOT my favorite colors! 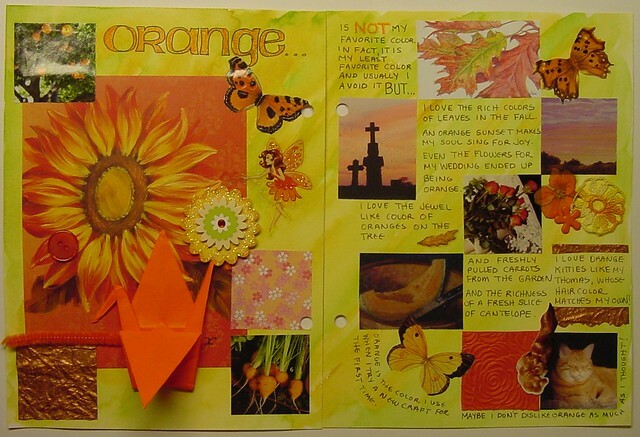 I even did an art journal page once on that topic! But last autumn, when the CQI Retreat went to the wonderful store, Florilegium, in Westport, MO, I spotted this tiny velvet pillow in luscious shades of peachy orange and yellow and fell in love! This little pillow, lush as a ripe peach has stayed in my mind ever since and I've been wanting to do a block in these lovely colors. Notice I said "A" block. So how did it turn into a whole quilts worth of blocks? I'm still asking myself that question too! Chalk it up to Pinterest! I found this lovely block and was inspired by the level of stitching on it. As I've been thinking about CQJP, I knew that I wanted to do something different than pincushions this year, and wanted something that would stretch me to learn a bit as well. My blocks in the past have tended to be all about the seams and sometimes a motif or two. It's really the stitching that I love and this block on Pinterest captured my imagination. I found another pin of the entire block. I really loved the warm colors in the background and how it allowed the stitching to harmonize like a rich tapestry. So for CQJP 2015, I really want to work on filling my blocks with stitching. I haven't decided yet if I will add lace or not. 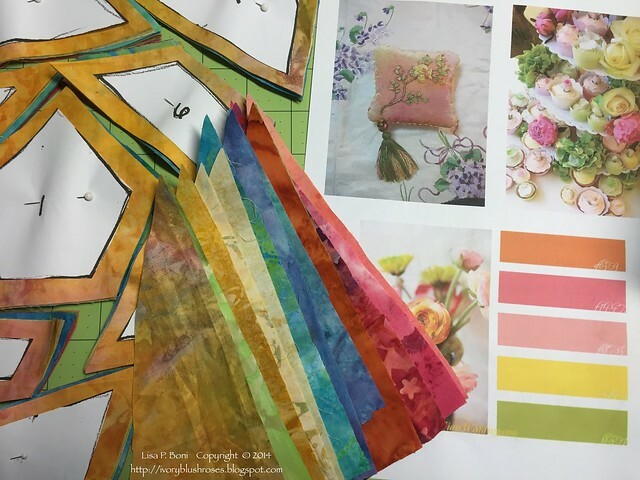 If you look at my CQJP Inspiration board, you'll see lots of great photos of similar blocks and variations on the color scheme I chose. So I chose my fabrics and taking a lead from Gerry K who recently had some great posts about piecing blocks, I found a CQ block that I liked, made a few modifications to suit myself, scaled it up to 8 inches square on the copier and then taking a lead from Allie Aller's Craftsy Class (which I highly recommend! 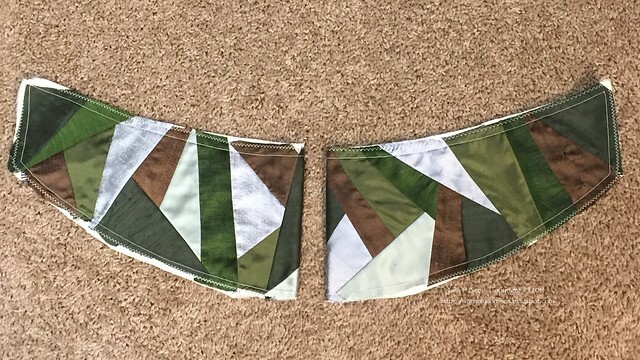 ), I tried piecing in a little different fashion than I usually do. I normally am not at all fond of piecing and it takes me an inordinately long time. But using this method, I managed to piece blocks for two quilts in two day-long work sessions! A record for me! I need to say something here about taking classes. 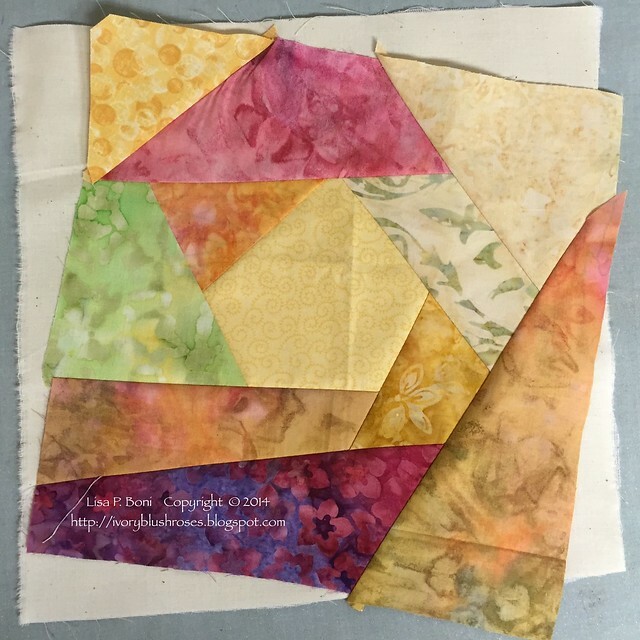 Yes, I've been crazy quilting for a while now, so why would I take a beginning crazy quilting class? Well, I've learned that no matter how much you know, there is always something else to learn and sometimes seeing how someone else does things makes something you do a little bit easier. 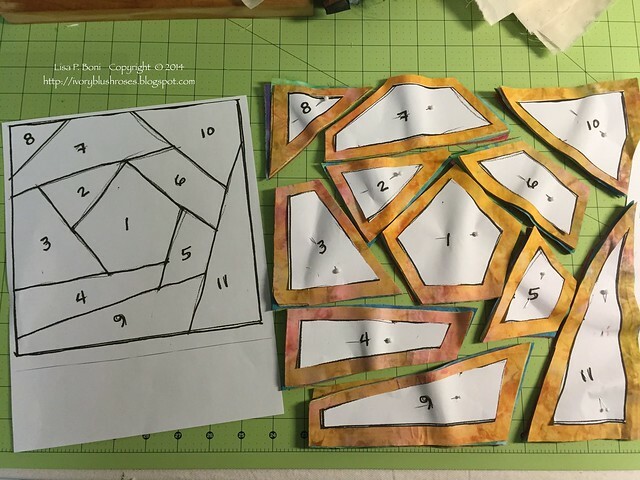 I learned so many little things from watching Allie's class, from watching how she uses the plastic templates as she works (something she never really talks about, but just does while she's working) to some of the tips and tricks she uses to make things easier! I've tried all sorts of new things for this year's CQJP and as a result, I've backed all my blocks with knit tricot interfacing, learned how to use my large quilting templates so much more efficiently, definitely learned how to piece easier and glue sticks... who knew! You'll have to sign up yourself through Craftsy to learn for yourself! 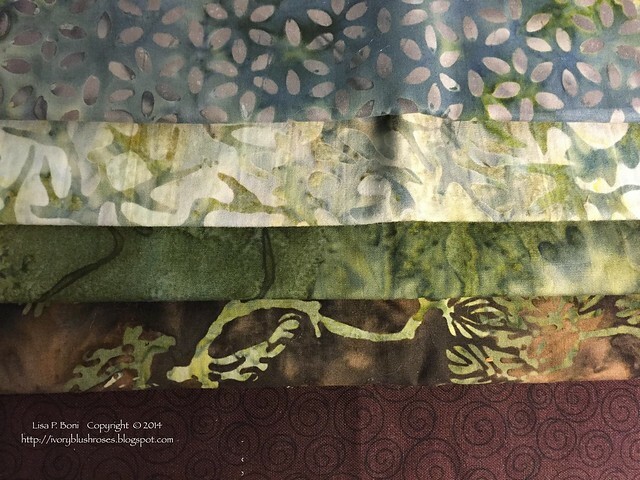 Here's my fabrics with some of my inspiration printed out. When I first laid the blocks out this is what I came up with. 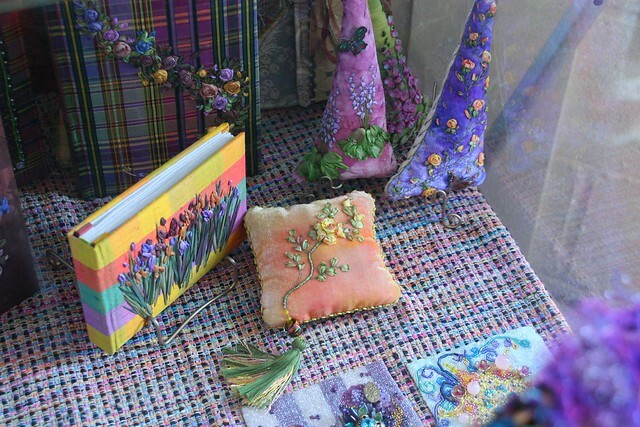 I had lots of inspiration photos with blue and purple that I liked, so had added those colors to my fabrics. But I really didn't care for the purple in the mix, so I removed those pieces. I definitely liked the blocks better without the purple, but the blue and bright green still seemed a bit much. I switched out the green for one slightly warmer and closer to the palette photo. I removed all the blue fabrics and exchanged them for some other yellows. Now at last, they have the feel of my color palette, heavy on the yellow/peachy/orange tones. The colors of a sunrise or sunset with a bit of green! 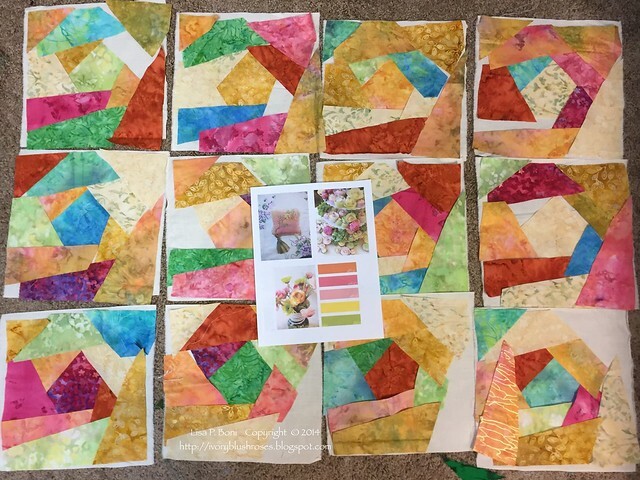 Piecing blocks by Allie's method really made things easy and I was able to make all 12 blocks in two work sessions! I must admit that I did have my share of learning curve though! Positioning that first piece correctly is really important! 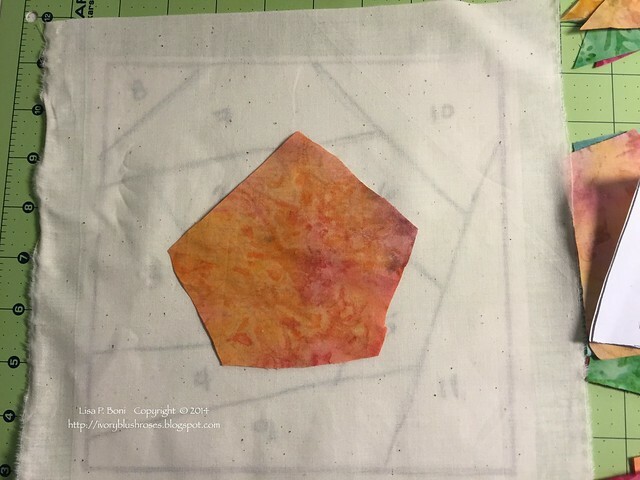 I did manage to salvage this block by adding more backing to the spots where the piecing spread over the edge! 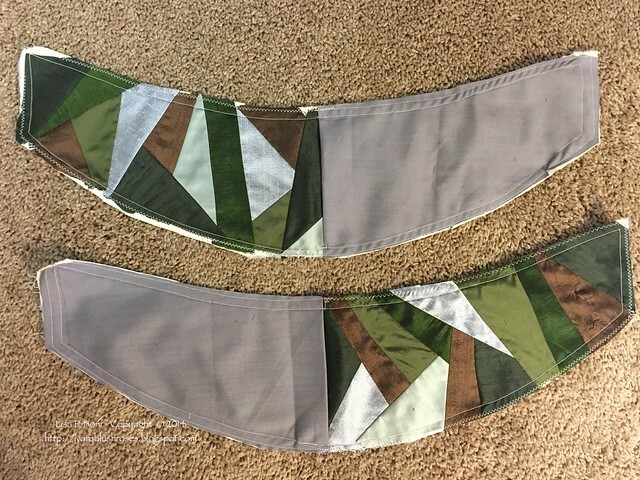 I also learned that if I want more than a 1/4" seam allowance around the outside, that I have to greatly increase the extra fabric on the outer edges of each patch. Lesson learned! When finished, though these blocks may start off being 8" square, they may end up closer to 7 1/2". 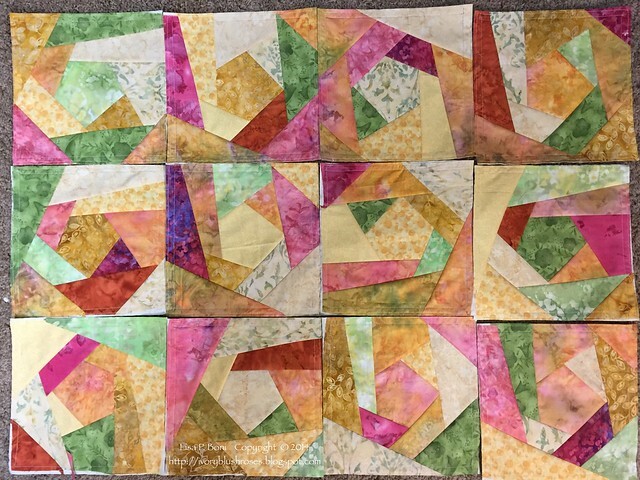 As you might imagine, after spending the better part of two days piecing orange and yellow blocks, I was beginning to have a little anxiety! How in the world am I going to be able to stay motivated to stitch this many orange/yellow blocks without going mad? The solution is in another project that has been brewing in the back of my mind for a long, long time. In the days before Pinterest, I saved a copy of this heart that Jo in New Zealand stitched. I loved the green background and the floral stitching on top of it. I've been wanting to do a project in a similar vein ever since. 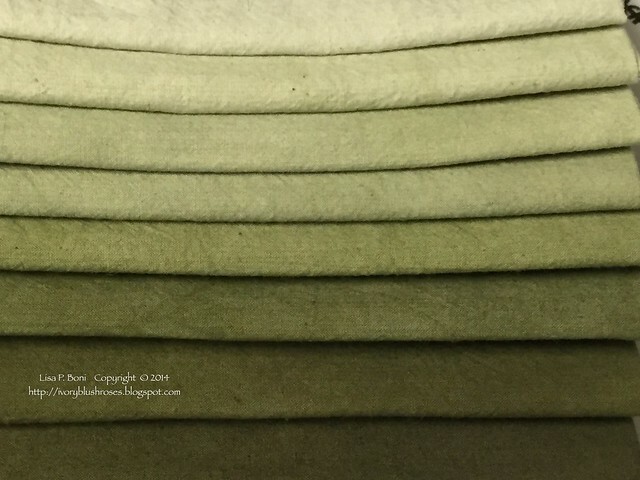 In the fall, I attended a small quilt show and one of the vendors, Liberty Homestead, had these great packs of hand dyed shaded fabric packs. I immediately knew they would be perfect for my "green" project! So I made 9 blocks in shaded greens as an antidote to the orange/yellow blocks! 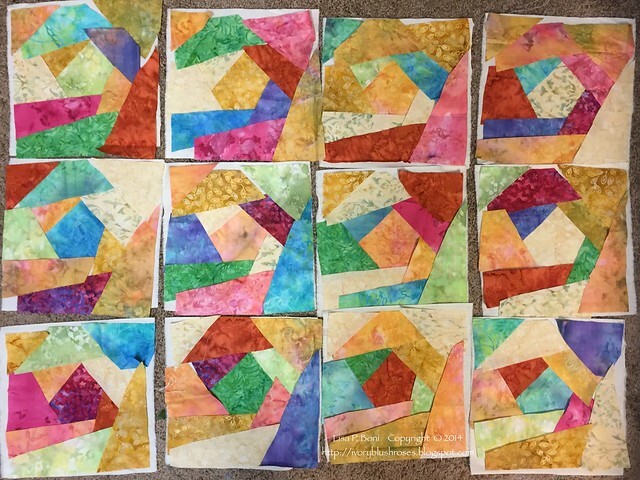 I used Sharon Boggen's Quilt Block 56 as the basis for these blocks, though I did change it ever so slightly. I can't wait to start stitching on these! 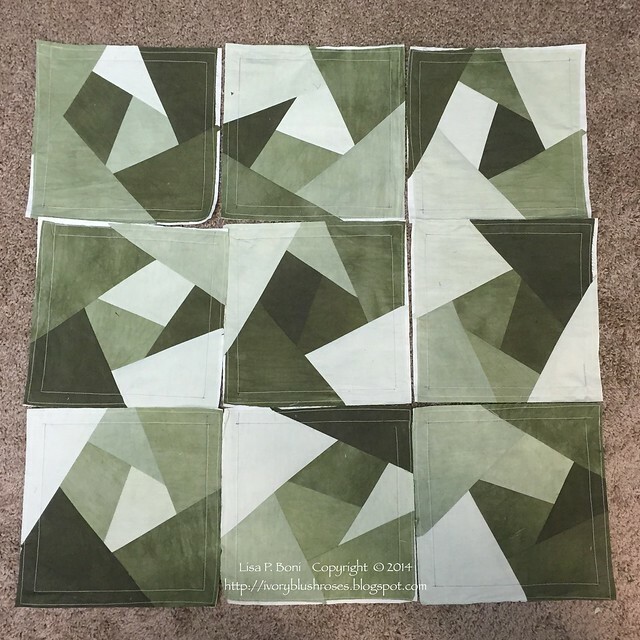 I am also making 4 Linen blocks so that for every month, I'll have either a green block or a linen block to work on when I can't stomach the yellow/orange anymore. Here's hoping that I can manage to stitch not just ONE block a month, but TWO! I wasn't quite done piecing yet. As I slowly move my stitching stuff into my daughter's old room, I am trying to adapt it my needs. Since I did not want to repaint the room just yet, I'm trying to find a way to integrate the pale grey walls and dark grey curtains into something that I find relaxing. I decided upon a woodland scheme of brown, warm greens and cream to complement the grey - the colors of a Birch woodland. The dark grey curtains cover more of the window than I would like, so a pair of crazy quilted curtain tiebacks seemed the perfect way to bring my colors into the room! 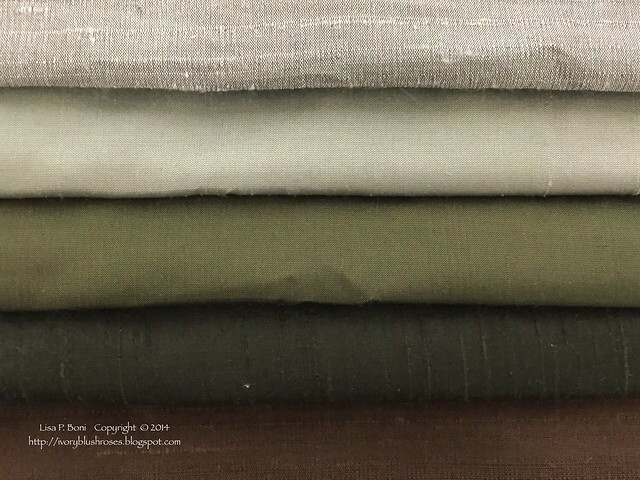 I tried three different fabric palettes in the colors I wanted. These are the batiks. 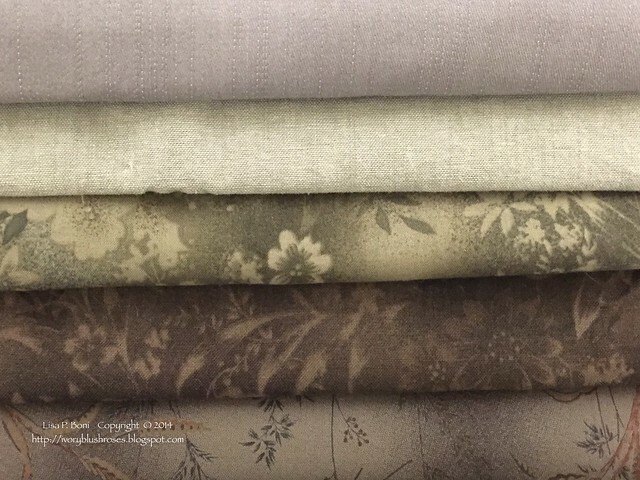 These are some Japanese fabrics (which I really got for a completely different project that is on the far back burner). In the long run, I decided on the silks as giving the look I wanted. I only want to crazy quilt the part that shows, so I used some gray suiting fabric for the back sides. I think they will look great when finished! Can't wait to get started and I think that this us what I'm going to spend this snowy cold afternoon stitching on! Phew! I'm overwhelmed just looking (and reading about) all your plans! Not just one project - but two. Amazing! Can't wait to see what you do with both these projects. What a great inspiring post for the end of 2014. 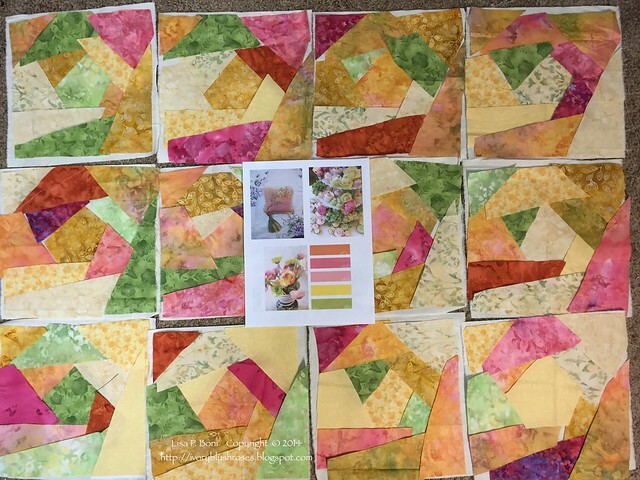 I think your squares for 2015 turned out to be a lovely combination of those colors. I know you will do a beautiful job with them and I look forward to seeing your wonderful stitchery. May 2015 be a wonderful year for you. All I know is that God Is Good!